Filtering unwanted signals is an essential function of many electronic systems, including commercial and military platforms such as communications, electronic-warfare (EW), and radar systems. One of the choices for filter responses is the high pass filter, which suppresses signals lower in frequency and ideally passes signals higher in frequency unaffected. 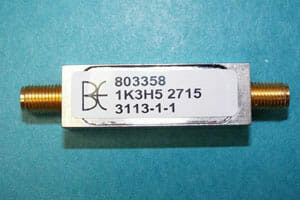 Model 803358 is the latest high pass filter from Bree Engineering Corp. (www.breeeng.com) with an impressive upper passband of 2 to 18 GHz and a total bandwidth of DC to 18 GHz. The high pass filter achieves 40 dBa minimum rejection of signals at frequencies below 1650 MHz, with as much as 70 dBa minimum rejection of unwanted signals from DC to 1500 MHz. Within the nominal passband from 2 to 18 GHz, the insertion loss is less than 1.2 dBa and typically less than 1.0 dBa. The return loss is 14 dBa or better and typically 17 dBa from to 2 18 GHz. The rugged model 803358 high pass filter measures 1.50 X 0.50 X 0.40 inches and is supplied with female SMA coaxial connectors at input and output ports. Other package configurations are also available upon request. Bree Engineering offers a wide range of filter types, including lowpass, high pass, bandpass, and band-reject filters for applications from RF through millimeter-wave frequencies, in a variety of packaging styles, including miniature surface-mount technology (SMT) and coaxial connectors.